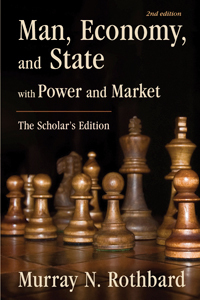 The Mises Institute's new edition of Man Economy, and State, united with its formerly sundered companion volume Power and Market, is a landmark in the history of the Institute. It takes this book out of the category of underground classic and raises it up to its proper status as one of the great economic treatises of all time, a book that is essential for anyone seeking a robust economic education. This new edition will take your breath away with its beauty and quality. It's remarkable that a book this thick could lay so flat and be so durable with super-solid binding. It somehow turns out not to be unweildy. Get it with the Study Guide and you will have what you need. The captivating new introduction by Professor Joseph Salerno frames the Rothbardian contribution in a completely new way, and reassesses the place of this book in the history of economic thought. In Salerno's view, Rothbard was not attempting to write a distinctively "Austrian" book but rather a comprehensive treatise on economics that eschewed the Keynesian and positivist corruptions. This is what accounts for its extraordinarily logical structure and depth. That it would later be called Austrian is only due to the long-lasting nature of the corruptions of economics that Rothbard tried to correct. For years, the Mises Institute has kept it in print and sold thousands of copies in a nice paperback version. Then we decided to take a big step and put out an edition worthy of this great treatise. It is the Scholar's Edition of Man, Economy, and State—-an edition that immediately became definitive and used throughout the world. The footnotes (which are so brilliant and informative!) are at the bottom of every page. The index is huge and comprehensive. The binding is impeccable and its beauty unmatched. Students have used this book for decades as the intellectual foil for what they have been required to learning from conventional economics classes. In many ways, it has built the Austrian school in the generation that followed Mises. It was Rothbard who polished the Austrian contribution to theory and wove it together with a full-scale philosophy of political ethics that inspired the generation of the Austrian revival, and continues to fuel its growth and development today. What's striking is how this remarkable book has lived in the shadows for so long. It began as a guide to Human Action, and it swelled into a treatise in its own right. Rothbard worked many years on the book, even as he was completing his PhD at Columbia University. He realized better than anyone else that Mises's economic theories were so important that they needed restatement and interpretation. But he also knew that Misesian theory needed elaboration, expansion, and application in a variety of areas. The result was much more: a rigorous but accessible defense of the whole theory of the market economy, from its very foundations. But the publisher decided to cut the last part of the book, a part that appeared years later as Power and Market. This is the section that applies the theory presented in the first 1,000 pages to matters of government intervention. Issue by issue, the book refutes the case for taxation, the welfare state, regulation, economic planning, and all forms of socialism, large and small. It remains an incredibly fruitful assembly of vigorous argumentation and evidence. A major advantage of Man, Economy, and State, in addition to its systematic presentation, is that it is written in the clearest English you will find anywhere in the economics literature. The jargon is kept to a minimum. The prose is crystalline and vigorous. The examples are compelling. No one has explained the formation of prices, the damage of inflation, the process of production, the workings of interest rates, and a hundred of topics, with such energy and clarity. Over years, students have told us that this book is what made it possible for them to get through graduate school. Why? Because Rothbard takes on the mainstream in its own terms and provides a radical, logical, comprehensive answer. If you have read the book, you know the feeling that comes with reaching the last page: one walks away with the sense that one now fully understands economic theory and all its ramifications. It is a shame that the authentic edition of the classic that Rothbard wrote fully 40 years ago is only now coming into print. And yet the good news is that, at last, this remarkable work in the history of ideas, the book that makes such a technically competent, systematic, and sweeping case for the economics of liberty, is at last available. In 1972, this book was selling in hardback for $130-$150 in current dollars. So the scholar's edition, which includes Power and Market, a great index, plus improved layout, is about a fraction of the cost of the original, for a far better product. One of the last great systematic treatises of economic thought published post World War 1. This books crafts a well-thought foundation for economic thought. Building off of human action in an economy of scarce resources, it  breaks down how entrepreneurship, real value judgements, and risk taking drives the market. It will be an enjoyable and informative read for anybody who enjoys praxeology, human action, and economics. If you have the chance, do not abnegate yourself the pleasure of reading this book! It would be nice if Mises Store put up some more affordable shipping option for buyers outside of US. Though the books price are relatively much cheaper here than at Amazon, but if one is compare the total sum of the purchasing (esp. for the hardcover one), one would certainly opt for the latter.I've only paid $9 for this excellent book at Amazon comparing to a $40+ if I've instead decide to purchase it at Mises Store (if one opt for the lowest shipping option fee). Since I don't care much about the shipping time, it's only appropriate for me to choose Amazon although I would prefer to purchase it instead with Mises Store if it's not for its higher shipping fee. Its better and easier to understand. I just go the book, and wanted to say that the printing and binding takes this book into the realm of a work of art. The typesetting, the paper, the durable cover--all beautiful. I was especially impressed to see that it will lay flat on its own no matter what page it is open to. I wish more books were of this quality. I will note that all hardcover books I have purchased from the Von Mises Institute are of uniformly high standard of quality. MES is so clearly written that any thinking person can read it and receive an education, not only in economics, but in rational thinking, analysis, and most especially, exposition. It demands a permanent place in the library who loves liberty. Which is why Josh is right. This book, with P&M restored, easily justifies a premium-priced leather edition.